The Queen has visited Gloucester in beautiful weather for the traditional Maundy Thursday service. 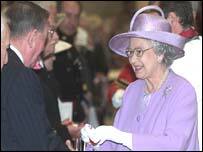 Accompanied by the Duke of Edinburgh, the Queen gave out special Maundy Money to pensioners in the cathedral city. A ceremony in Canterbury on Thursday will also see 12 people become the first in 400 years to have their feet washed by the head of the Church of England. The Archbishop of Canterbury, Dr Rowan Williams, will carry out the ancient ritual to mark the start of the most important week in the Christian calendar. The Queen, wearing a lilac wool and crepe coat, matching print silk dress and hat, and the Duke were introduced to local figures by Lord Lieutenant Henry Elwes. The Queen met families of Territorial Army members who had served in the war in Iraq. Hundreds had gathered to greet the Queen, with office workers watching out of windows as she moved into the cathedral which was used for some scenes in the Harry Potter films. The archbishop's Maundy ceremony is a symbolic act of humility, based on Christ's washing of his disciples' feet after the Last Supper. The Queen gave her traditional Maundy Money to 77 men and 77 women. The Queen has attended the ceremony every year since 1971, and on all but four occasions since she came to the throne in 1952. Recipients of the specially minted Maundy coins are all senior citizens, recognised for their Christian service to the community. The number of pensioners receiving Maundy Money this year reflects the Queen's age - she will be 77 on 21 April, Easter Monday. The oldest person to receive the coins was 99-year-old Dorothy Judd, and the average age of the recipients was 80. After the service in front of 1,600 people, the Queen smiled as the crowd outside sang Happy Birthday and gave her three cheers. Maundy Money recipient Mary Seabright, 79, from Bishops Cleeve, near Cheltenham, said she was pleased to receive the money and described the Queen as "very genuine". "She was very relaxed. You see her so often on television that you feel familiar with her and she was very genuine." 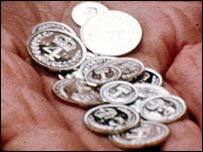 The pensioners received a set of silver coins, consisting of one, two, three and fourpenny pieces with a total value equal to the Queen's age.